26-year-old Devin Patrick Kelley killed 26 and injured 20 others at the First Baptist Church in Sutherland Springs, Texas. Robert Bowers was 46 when he shot and killed eleven worshipers at the Tree of Life Synagogue in Pittsburg, Pennsylvania. What do these three people have in common? You say that, clearly, it’s that their ages end in sixes. True, but this is not what is noteworthy! WHAT IS NOTEWORTHY IS THAT ALL THREE HAD EASY ACCESS TO GUNS. It is this sentence that enables the National Rifle Association and other gun lovers in the United States to defeat every effort on the part of the authorities to control the willy-nilly sale of weapons to the general public. By shouting “unconstitutional” and following up with generous campaign contributions to legislators and then legalizing their actions by claiming their donations are to protect the Constitution, however out-of-date some of its clauses may be. To millions of Americans the Constitution’s text is carved in stone. is a strange concept because I have been brought up in England where, in my youth, not even the policemen were armed. To stop gun-killings in the US requires draconian measures but, and this is the rub, they must be such that that they do not run afoul of the principles outlined in the Constitution. Simply put, this means that, to succeed at controlling guns, we must act in a way in which we can have our cake and eat it at the same time. Define “Arms” as any semi-automatic handgun with the characteristics equal to or less powerful than the Colt Junior 25 acp (short barrel, small bore, magazine limited to seven rounds or less.) Note that such a weapon’s fire-power is superior to the front-loading muskets’ with which the Founding Father’s militiamen were equipped. Establish a Central Weapons Licensing Bureau (CWLB) in Washington serving the entire country and run by the Federal Government. (No more licensing by States). Revoke existing gun licenses for all handguns and assault rifles. 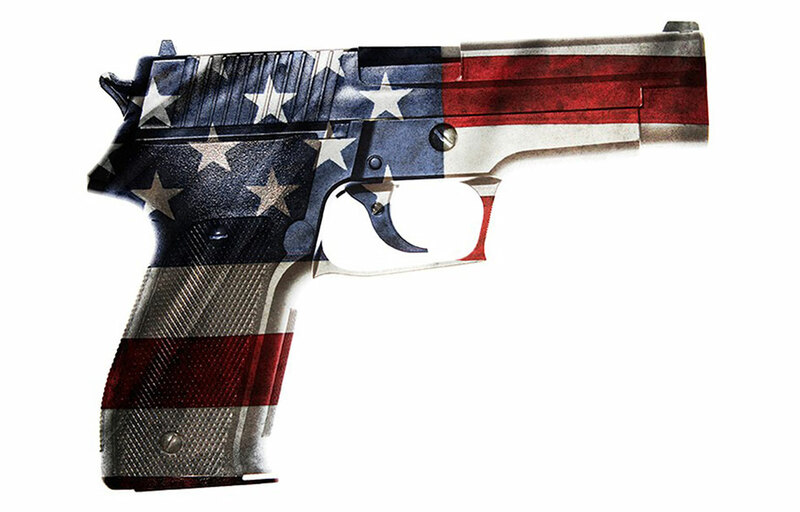 Authorize the CWLB to issue, but only on request, one lifetime license to “bear Arms” (to wit: one only handgun with characteristics as described above) to each legal resident of the US twenty-one years of age or over, but only after such a person has passed a compulsory background check. This should satisfy those enamoured with the Second Amendment. Authorize the CWLB to issue licenses, on request, for recreational and hunting weapons, to those who have passed a compulsory background check and have completed a compulsory eight-hour firearms course. Prohibit the licensing and/or sale of any and all types of assault rifles. (Zero tolerance). Legislate that any person found in possession of an unlicensed firearm is automatically imprisoned for five years with no right to bail, or time off for good behaviour while in custody. Too draconic and complicated, you say. May be, but less expensive than the cost of the carnage (in health care, funeral costs, loss of human talent and just plain suffering) presently being visited upon us by those who use guns with evil or irresponsible intent. All THAT IS NEEDED IS THE POLITICAL WILL of a courageous administration. Let me share with you the words of my friend whom I had asked to preview this blog: Where are the aliens who will land on earth and implement this, along with climate control, access to medical care and a right to free education for all? Makes sense. Unfortunately those lunatics value their guns more than human life. They all conveniently forget the first words, “A well-regulated militia…” All the rest of the 2nd amendment has to be read with these first words in mind. They didn’t come at the end of the amendment. They did not come as an afterthought – they are the first words. And a well-regulated militia, is one regulated by the state and therefore the state does have the right to “regulate” – decide which arms, how many and who. With re::,The US of A : why does it seem so clear to us on the outside..’We’ all know the mistranslation of their 2nd amendment is the biggest hoax perpetrated on their nation. .So yes! Where is their will’? Seemly getting buried deeper with each new victims’ funeral. The technology is out there!! There is so much to gain by promoting it and everything to lose by not. So where is the ‘collective’ will!? It is all breaking my heart..
My only hope is, with every election from here on in globally, it is a ‘young’ father or mother who wins ‘the seat’ . To me it seems vital to remove from power all the billionaires who have lost their moral compass! (& I recognize there are some who haven’t ). There realty is no more ‘time’ left to waste! Click to read archived blogs!